Discipline is the key to wealth. 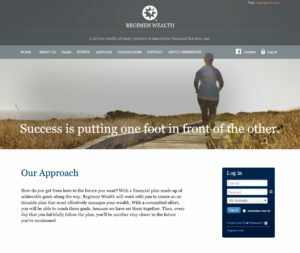 An Ameriprise financial advisory in Atlanta, which had originally been named after its founder, wanted to rebrand to a name that would better communicate how it works with clients. Its approach: set reasonable goals for clients, and hold them accountable. How do you get from here to the future you want? With a financial plan made up of achievable goals along the way. Our financial advisors work with you to create an actionable plan that most effectively manages your wealth. With a committed effort, you will be able to reach these goals, because we have set them together. Then, every day that you faithfully follow the plan, you’ll be another step closer to the future you’ve envisioned. Strongly associated with exercise and working out, “Regimen” captures the idea of following a disciplined process to achieve a desired goal. Its serious tone helps potential clients understand that effort will be required of them. This approach may not be for everyone, but clients who understand that success requires commitment do appreciate the prodding—not unlike a coach who pushes athletes to perform their best.